It's 05:00 in Hvar, Croatia right now. 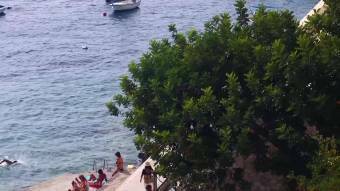 Hvar Port Entrance 24/7 Live webcam overlooking the entrance to Hvar port and Pakleni islands. Hvar: Harbor View, 0 miles away. Hvar: Hvar Panorama, 0 miles away. Milna: Port and Old Town, 10.7 miles away. Milna: View along the Bay, 10.7 miles away. Jelsa (Hvar): Marina, 12.6 miles away. Jelsa (Hvar): Panorama onto Jelsa, 12.6 miles away. Jelsa (Hvar): View over Jelsa, 12.6 miles away. Jelsa (Hvar): Sea Promenade, 12.6 miles away.